A crash in Tapping where a man was critically injured. A SPATE of serious motorcycle crashes in the district, including two deaths, has led police to call for safer behaviour from riders. Since October 20, two young men have been killed and four men badly injured in crashes in Hocking, Hillarys, Tapping (twice), Joondalup and Butler. It has been the worst streak of motorcycle crashes Traffic Enforcement Group Sergeant Gary Walker has seen for several years. The latest had a man suffer serious leg injuries when his motorcycle collided with a car in Butler on November 28. 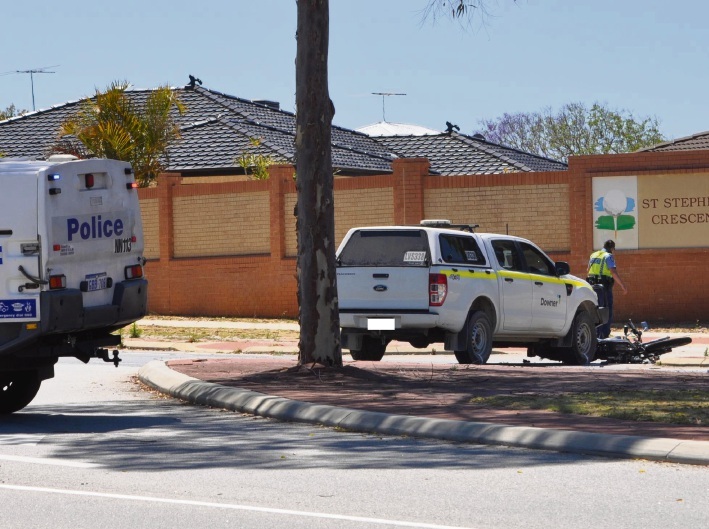 It followed a crash just four days earlier in Tapping where a 24-year-old man was critically injured in a collision with a 4WD. The fatal crashes happened in Hocking (October 20) and Joondalup (October 15) involving males aged 17 and 24. Speaking generally about motorcycle crashes, Sgt Walker said a lot of the time riders were at fault through inattention or speed. He admonished behaviour such as lane splitting, where motorcyclists rode through the middle of traffic. “We do target them with stops for vehicle checks and licence checks but at the end of the day, the way some people ride, it’s their lives in their own hands. Take due care and ride to the conditions,” he said. Anyone with information on the recent serious crashes can call 1800 333 000.